A seamless transition in The Lake Villas by Neri&Hu. Suzhou, China known for its classic gardens and winding canals serves as the inspiration for Neri&Hu's Lake Villas located on the Yancheng lake. The common elements of the villas are its minimal colour scheme. In the video, the beige wispy reeds on the waterfront seamlessly transition to an earthy green sheer curtain in the next frame. 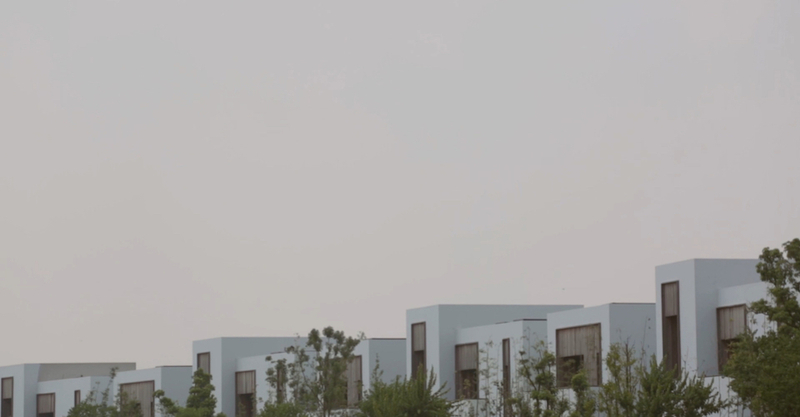 The villas are characterised by their floating white boxes that seem to defy gravity and are extensions of the pale sky. The intentional use of earthy tones serves to keep the viewer in the frame; as the frames change from one image to the next, the viewers attention remains. In the surrounding environment of the Yangcheng lake, nature is unbothered. There are no big changes in the movement and structure of the environment—and most importantly there are no distractions. Inside the villas, rooms are embellished with neutral fabrics and warm oak walls. The aesthetic fits the minimalist theme which muddies the line between interior and exterior. Like the surrounding environment, there are no distracting elements in the result of the villas. The Lake villas simply imitate nature to create a consistent, extended surrounding.